Identify and track the factors that put your production or suppliers sites at risk. Anticipate disruption risks and better devise risk management strategies. At a glance, identify most exposed companies. Impact and responsible investors, use ERP to identify critical challenges and opportunities in “green” investment. Submit your loan/insurance book to environmental risk profiling. Be sure you factor in the most relevant regional and local exposures. Improve and streamline your environmental risks analyses to make your research process faster. Focus on the factors that matter the most. Build on latest scientific results & datasets. 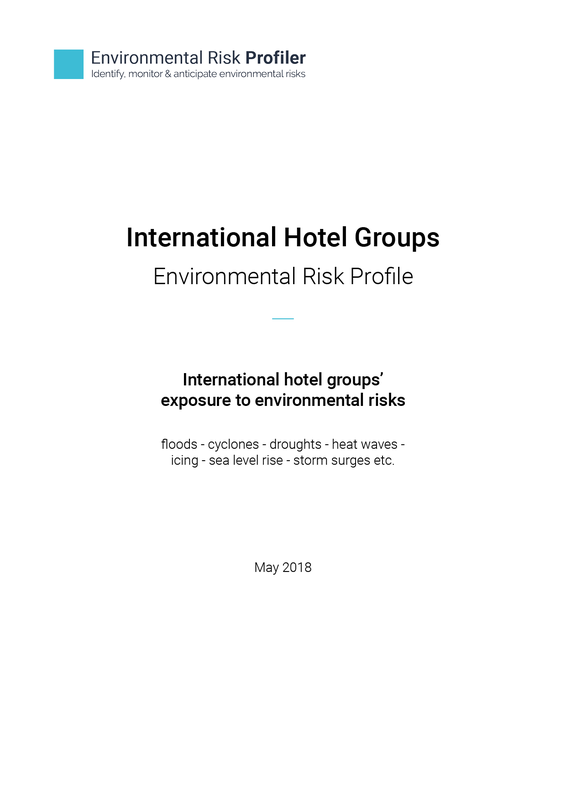 WHY AN ENVIRONMENTAL RISK PROFILE? 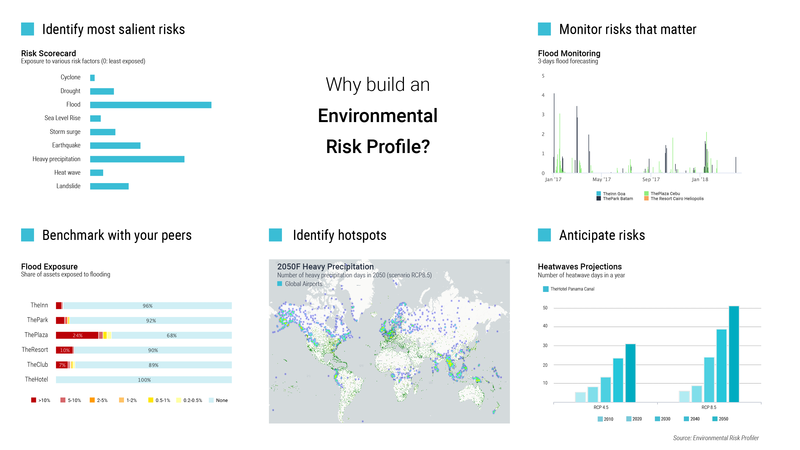 Our Environmental Risk profile allows you to compare risk distribution over various metrics and determine exposure at a glance. Are your assets or suppliers more exposed to droughts, sea level rise, or heat waves? You can also perform peer group analysis across companies and sectors. Using our trackers, you can follow some key metrics on a daily, weekly or monthly basis for all your assets. Factors include floods, droughts, heat waves, pollution incidents, violations, deforestation etc. Set up alerts to receive early warnings when critical levels are reached. Many risk factors will be impacted by climate change. At a glance, see what various climate change scenarios could mean for your operations or assets. Environmental risks are all about location. ERP helps you map your operations, assets or suppliers. At a glance, see where the hotspots lie for various risk factors. Global climate change is likely to be accompanied by an increase in the frequency and intensity of heat waves, putting thermal power operations at risk. At a glance, see which power companies are the more exposed under various climate change scenarios. Airports are often located on the coast, few meters above sea level. See how climate change might bring new height to storm surges and cyclones intensities. Use our Environmental Risk Profiler to anticipate such risks as well as the increase frequency of heavy precipitation to design the best mitigation measures and avoid increase of airport delays. Assess each property’s exposure to sea level rise across various climate change scenarios. Our trackers also include the extreme sea levels caused by storm surges and high tides. Identify vulnerability to coastal and fluvial flooding. A growing number of companies are devising responsible sourcing strategies. These often include commitments on zero deforestation. Use the Environmental Risk Profiler to check that suppliers respect their engagement, see historical deforestation rates and be alerted when active fires are detected. If you want to know more about our services and solutions, get a demo of our platform or receive an environmental risk profile sample, please fill in your email below. We’ll get back to you very shortly. 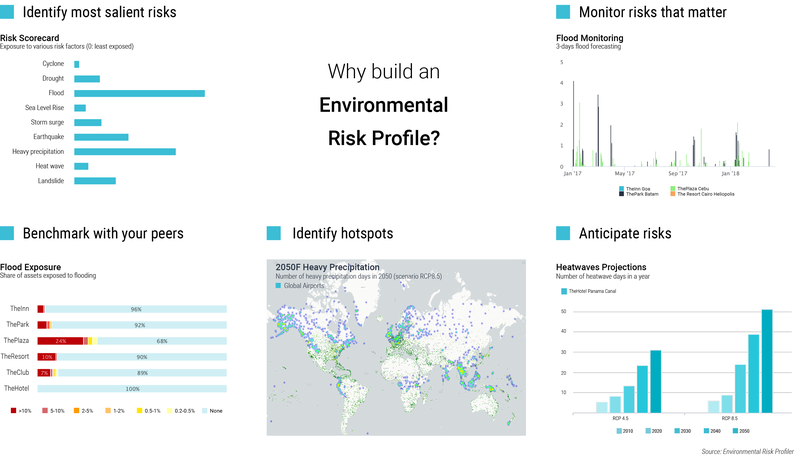 The Environmental Risk Profiler (ERP) aims to help companies, investors and financial institutions identify most prominent environmental risks and integrate them within their business and investment decisions. 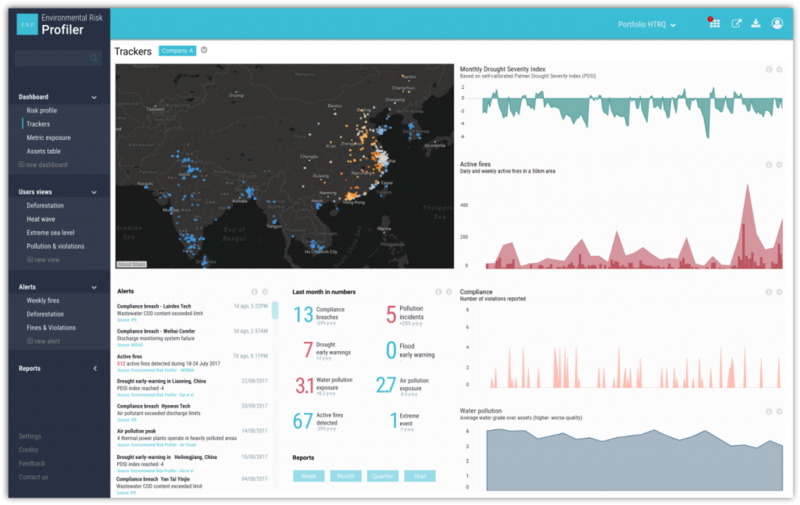 With ERP, you can track a wide range of environmental risk metrics across all your assets or suppliers, leveraging the latest local and global datasets and proven data science techniques. ERP is operated by Lucence Ltd, a spin-off from China Water Risk and ADM Capital Foundation.